Shwood has made a name for itself with its take on the classic Ray-Ban Wayfarers made from exotic woods like Zebrawood, Cherry, and East Indian Rosewood. But the grain on its latest design isn't actually wood—it's a veneer made from 1,600 feet of recycled newspapers that are rolled up, glued into paper logs, and sliced like lumber. Miraculous, right? From afar the thin boards look exactly like pieces of aged and faded wood, but it's only when you take a closer look that you realise those grain patterns are actually made up of black and white newsprint. 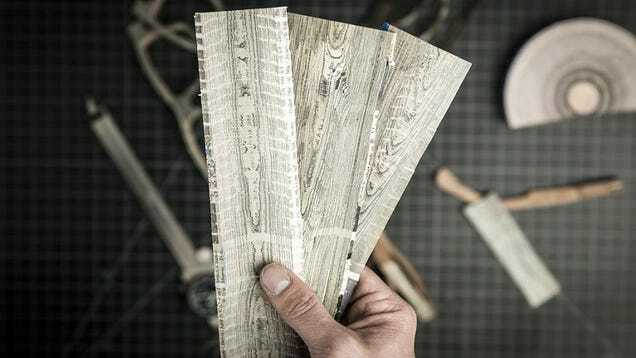 But don't worry about covering your face in ink every time you put them on or take them off, the newsprint material is actually used as a thin veneer on the outside of Shwood's sturdy wooden frames.